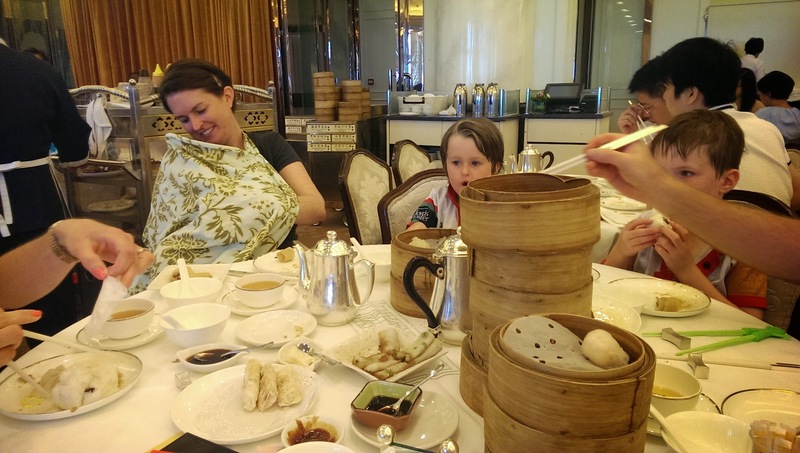 So a week or so ago, we returned from our 10 day trip to Hong Kong and Taipei. The trip was prompted by a desire to see my eldest brother and sister-in-law and their three kids. The secondary desire was a need to use my US Airways miles before their award chart goes through another devaluation. Right now both airlines are operating under their own carrier license with different pilots and crews, and different mileage programs. Once they begin using the combined certificate, which is assumed to be next year, then the remaining miles program (AAdvantage) will certainly want more miles for the same trip. If you want the history of Hong Kong, you can read this article. The short story is that is was Chinese and then became a British colony in the late 1800's with an agreement that the three separate territories comprising Hong Kong (Hong Kong Island, Kowloon, and the New Territories) would be handed back over to the Chinese in 1997. The Chinese have controlled Hong Kong since 1997 and it is one of two Special Administrative Regions in China, the other being Macau, a former Portuguese colony. Government under the Chinese is like the government under the Brits, a Governor is appointed by the controlling country. Hong Kong had scheduled direct elections for Chief Executive in 2017, however recently Beijing said that there would only be three candidates and they would for all intents and purposes pick those candidates. Hong Kong is easily accessible to Southern China which has seen an explosion of money thanks to our need for cheap electronics and clothing. This means that there's lots of people shopping there. Store after store in Kowloon. People even bring suitcases to put their stuff in. It was typhoon season, when we visited. If you want to know the difference between a hurricane and a typhoon, what matters is the location of the storm. Seriously. 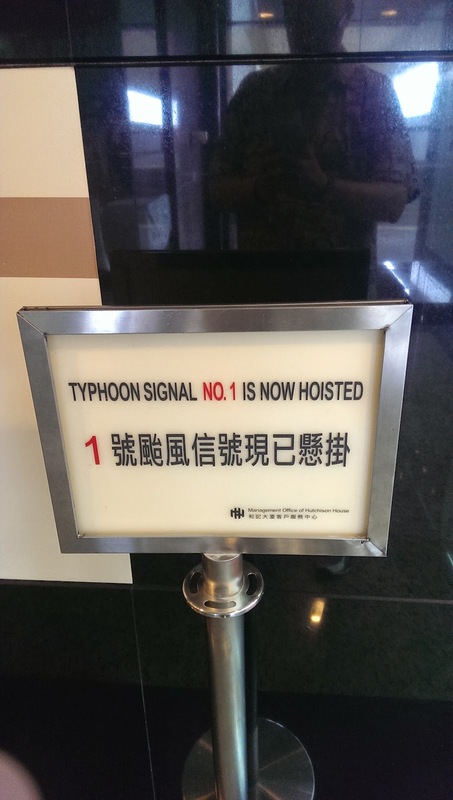 Also they hoist the typhoon flag, which is way cooler than issuing a Typhoon warning. The food is amazing. 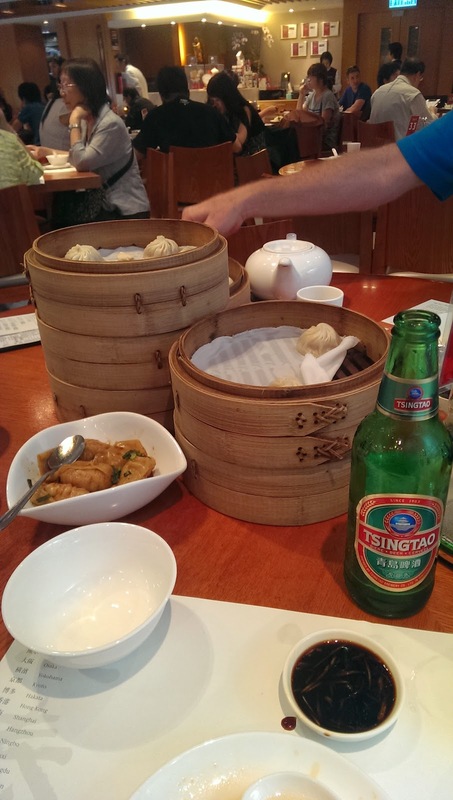 We gorged on dumplings and dim sum and pork buns. If you come here, you need to eat your face off and then nap. It was hot there. Like Washington, DC in August but with more sun. I didn't pack correctly for the trip, meaning not enough for two wardrobe changes a day. Which means we would duck into malls with air conditioning. Malls that have ... dumplings! The subway system is awesome. 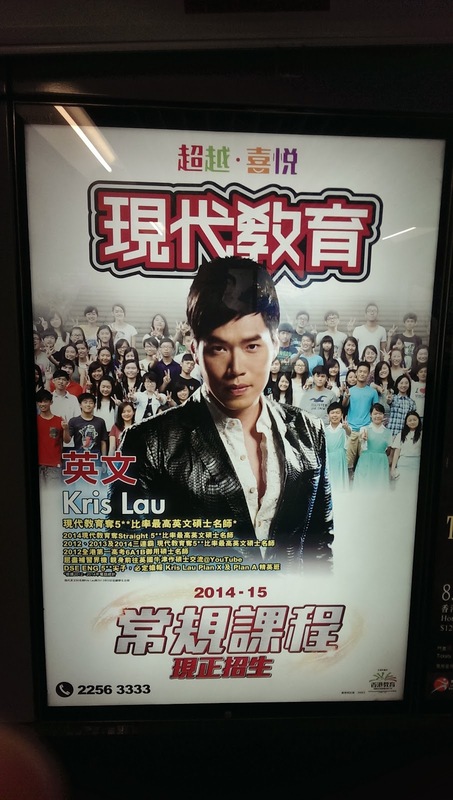 They have ads for science and math tutors that make them look like movie stars. See for yourself. It also shows that these kids will all be our future bosses. We had a terrific trip, and after the Kong we went to Taipei. I'll write more about that trip in the next post. Good seeing family and hope we can get out there again soon.